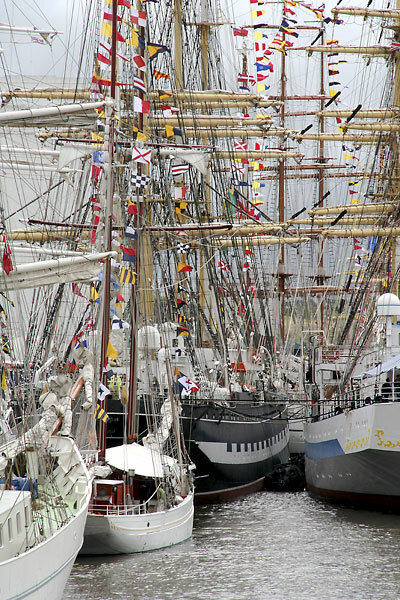 The larger tall ships were tightly moored along the quayside towards the Spillers flour mill. 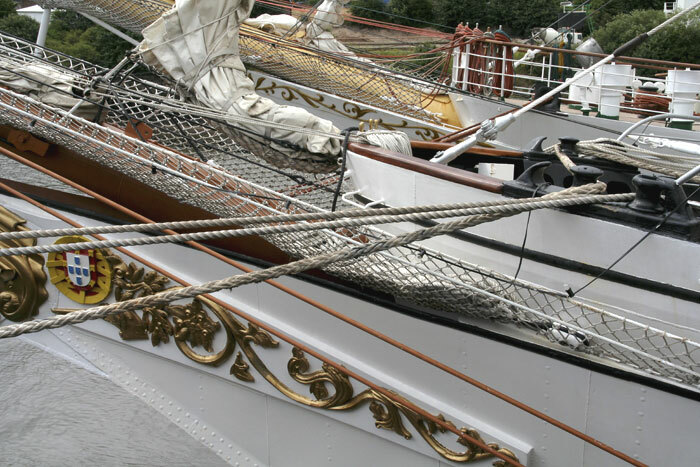 The curved bow of the Artemis rises lower left whilst, downstream, the Kruzenshtern's black and white hull and tall masts dominate the row. 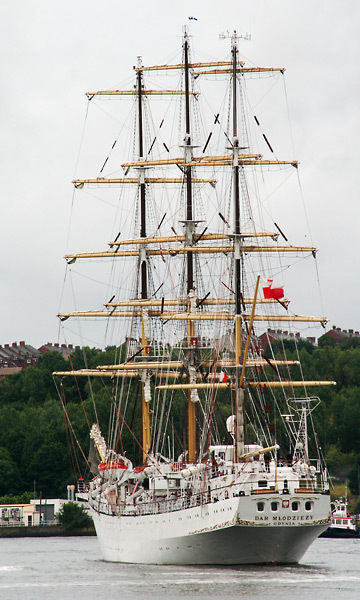 To starboard is the Russian Mir, launched in 1988 as one of five sail training ships. 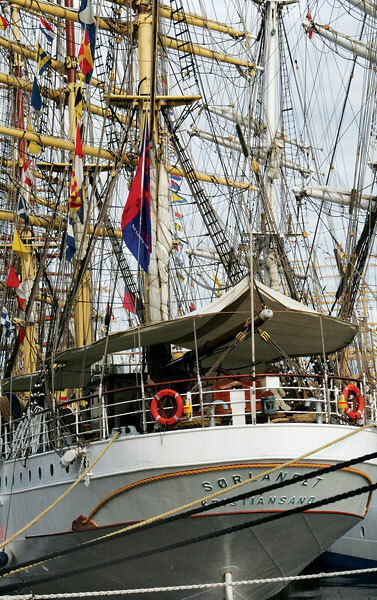 An officer leans against the taffrail of the Mircea, berthed ahead of the Sagres and the Dar Mlodziezy. 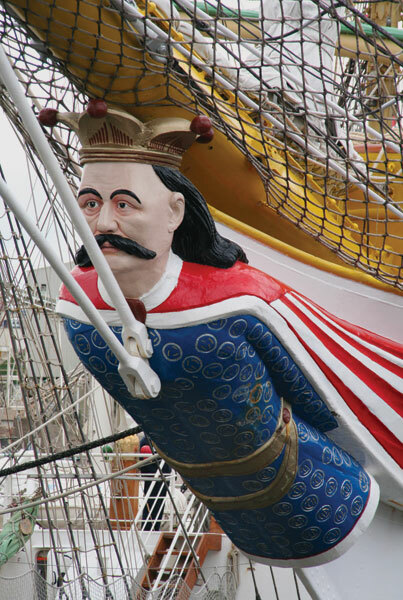 The carved and painted figurehead represents the ship's namesake, Prince Mircea the Elder, the ruler of Vallachia from 1386 to 1418. 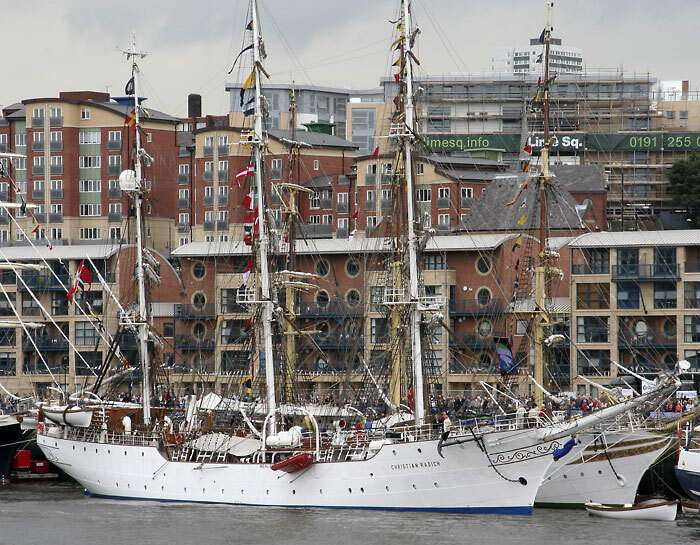 The Mircea has four surviving sister ships: Eagle (USA), Tovarisch (Ukraine) Gorch Fock (Germany) and Sagres II (Portugal). Photographs of the last appear next in this collection. This image sets the weather scene of much of the visit, although there was surprisingly little rain until the afternoon of sailing day. 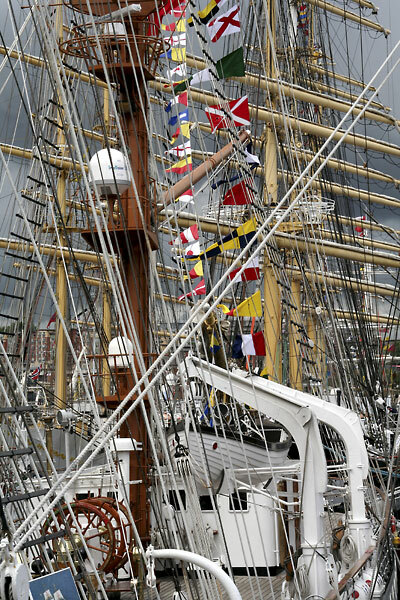 Here, a quayside view looks across the afterdeck of the SagresII to the ochre masts and rigging of the Kruzenshtern moored astern. 1937: Launched by the Blohm und Voss shipyard as the Albert Leo Schlagater . 1945: captured by American forces in Bremerhaven. 1948: acquired by Brazil in 1962: Bought by Portugal as a replacement for the original Sagres, a sail training ship dating from the start of the twentieth century. 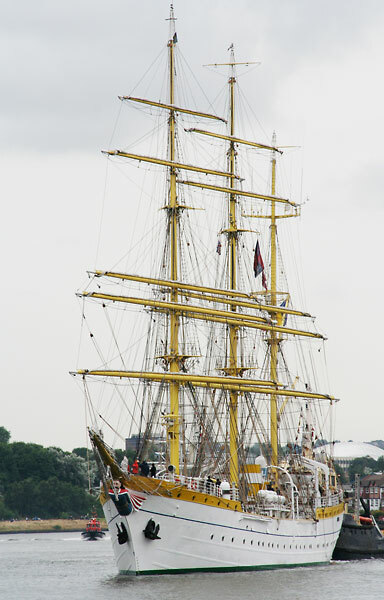 Like many other ships in the fleet, Sagres II was in immaculate order. 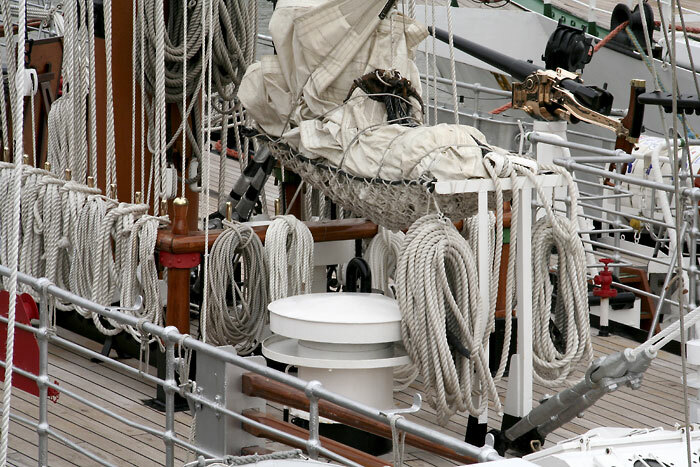 The functions behind the quantity and complexity of the sail related equipment was baffling to a landlubber like me. The relationships across line, shape, form, colour, pattern and texture were much easier to appreciate. The deck guns were interesting accessories. Apart from the general public being welcomed aboard many of the ships, some also hosted more formal events for invited guests. 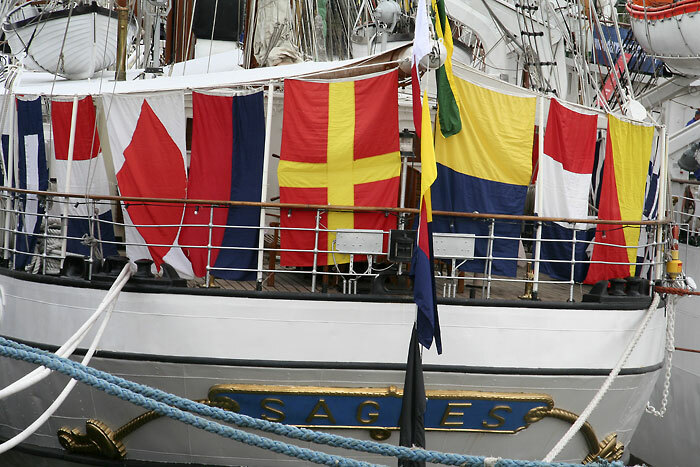 Later in the week, the Sagres II was brightened by a curtain of flags round the main deck as décor and welcome to such an occasion. 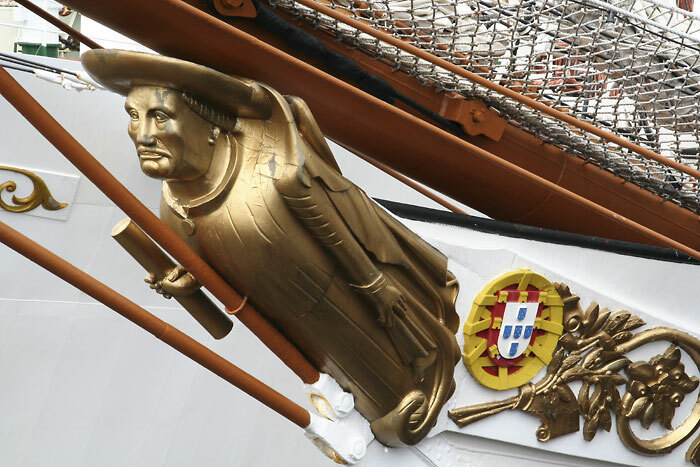 The ship's figurehead depicts Prince Henry the Navigator (1394-1430) who inspired the long term and worldwide exploration by Portugese mariners. Sagres was the principal harbour in Portugal in the fourteenth and fifteenth centuries. 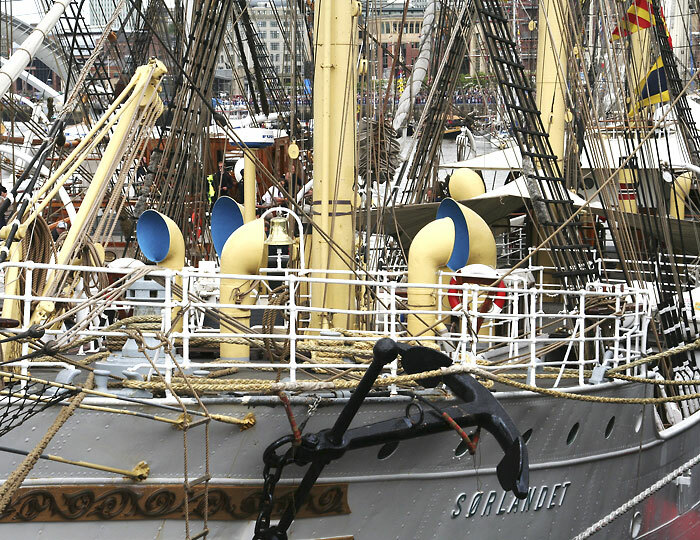 Shooting from the quayside offered many layered compositions across vessels moored two, three and sometimes four deep. 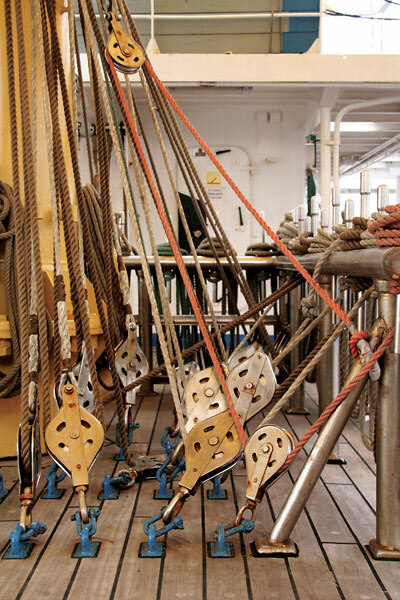 Here, the prows of the Sagres II and the Dar Mlodziezy are aligned. On sailing day, the Dar Mlodziezy was one of the early large ships to depart. After slipping her moorings and under motor power, she heads downriver into the second of several tight bends. The dull overcast gradually gave way to rain during the afternoon and rough waters awaited the fleet in the North Sea. 1927: Maiden Voyage to Oslo. 1933: Sailed to the Chicago World Fair, "A Century of Progress", as Norway's exhibition pavilion. WW2: damaged: used as accommodation for German sailors. 1948: restored to use: 1958: fitted with engine. 1974-77: laid up. 1977: Presented to the City of Kristiansand. 1981: Acquired by the Stiftelson Fullriggerin Sorlandet. The Dewaruci is named after the mythical sea god of truth and courage from Indonesian legend. 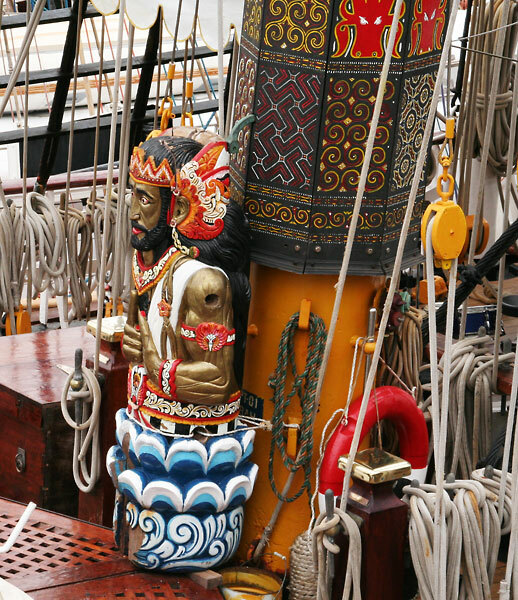 Carved, painted and varnished woodwork is a feature of the ship, including this large representation of the god placed at the base of the foremast. 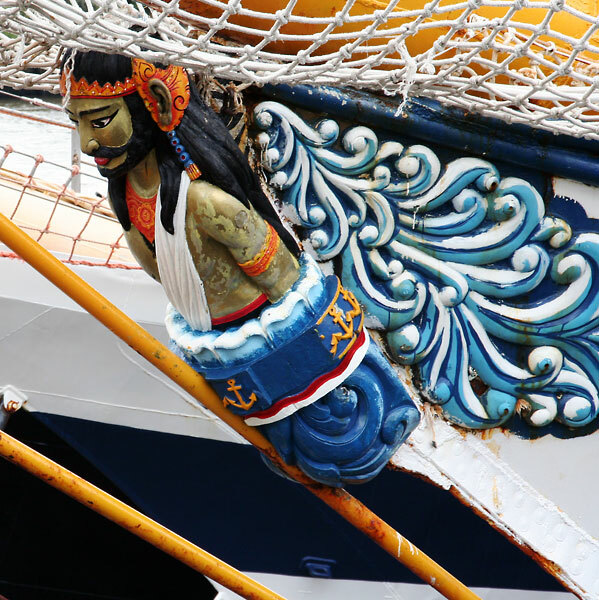 The Dewaruci is named after the mythical sea god of truth and courage from Indonesian legend, depicted in this slightly sea worn figurehead on the prow. 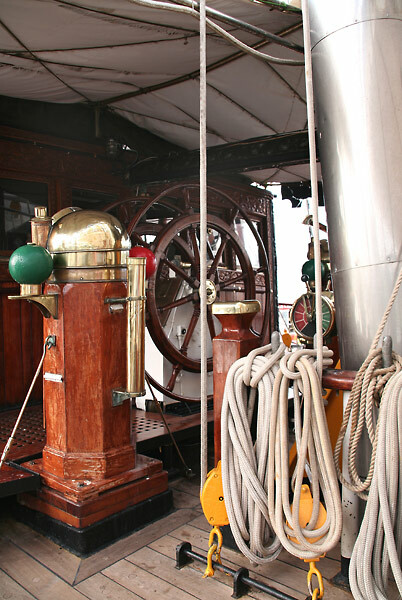 The ships' motto is Morals, Ingenuity, Courage and Loyalty. 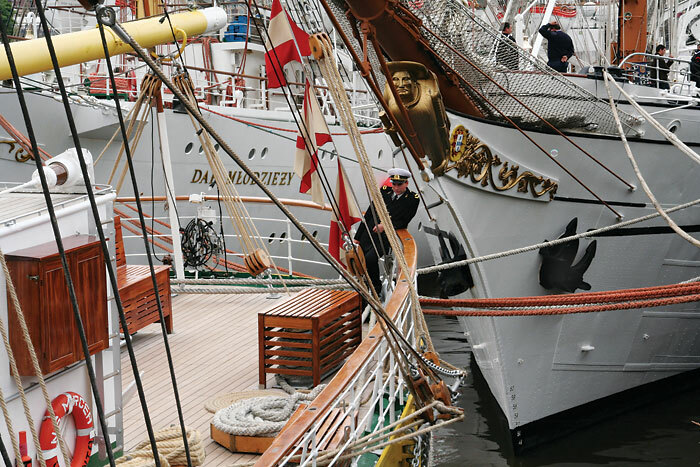 The Christian Radich is named after a Norwegian shipowner whose bequest in 1889 provided a fund for the construction of a sail training ship, belatedly launched in Oslo in 1937. Steel hull: 205 ft. Displacement: 1,050 tons. Mast ht: 124 ft. Sail area: 14,600 sq.ft . 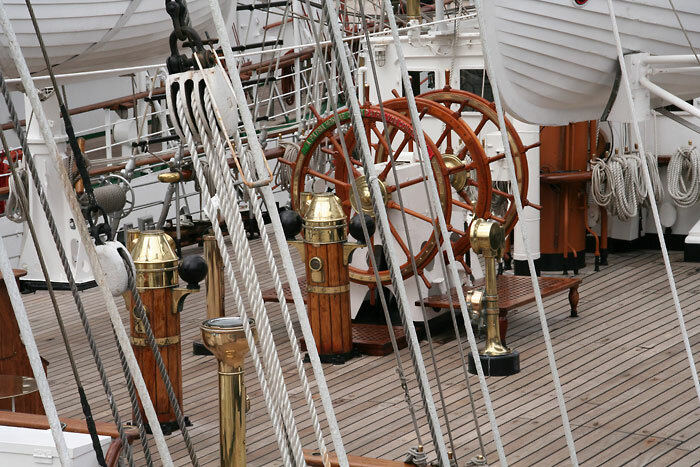 Sail speed: 14 kts: 18 permanent crew and 88 trainees/passengers.